What does a shark look like? 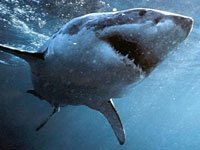 Although the great white shark is probably the most famous of this group of talented hunters and voracious eaters, sharks come in many different sizes, shapes and colors. In general, however, the torpedo-shaped body and sharp rows of teeth are the hallmarks of the shark. Some exceptions are the frill shark, a deepwater species, which resembles an eel more than a shark. Another variation is the pygmy shark, which grows no larger than 10 inches in length. The pygmy has light-producing organs on its belly and sides. It is thought that this its luminescence eliminates shadows, making this shark difficult to see when attacking its prey. Most species of sharks are found in the oceans. However, some of them are known to live in bodies of fresh water, like the bull shark which is known to travel up to 3,000 Km up the Amazon River. 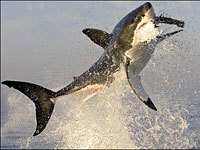 Sharks have succeeded for 450 million years because they are extremely good adapting to changing environments, therefore they can change their living area in search for food easily. Regardless sharks are cold blooded, they live either in warm, temperate and cold waters. Some species live mainly in cold waters, while some others prefer warmer waters. What does a shark eat? Different species also depend on different tactics for hunting and killing. 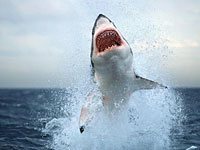 Some sharks rely on short high-speed chases. Other species prefer to wait for sedentary fish to come their way, and still others are scavengers on the look out for carcasses. Did you know this about sharks? 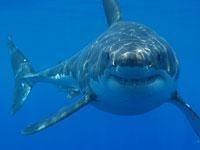 Sharks are constantly growing new rows of teeth. The teeth — which are embedded in the flesh rather than attached to the jaw — are replaced about every eight days. 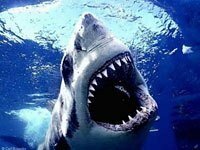 A shark can lose up to 30,000 teeth in a lifetime. Are sharks averse to dolphins? On an episode of Discovery Channel's Mythbusters, when a mechanical dolphin was placed near raw bait and a seal cutout, a feeding great white shark avoided both items, suggesting that they are. Sharks have existed for over 400 million years. For most of that time, they were relatively small; it wasn't until the giant marine reptiles went extinct, and mammals evolved into aquatic forms, that large sharks emerged. Download free Shark wallpapers, click on the image to open the large version. Print free Shark coloring pages, click on the image to open the large version.